When you have a cracked, broken, or heavily restored tooth, you may hesitant to bite down hard because you've heard that it can easily further fracture. A crown (sometimes referred to as a cap) is a full coverage restoration that restores the anatomical surfaces of a damaged or fractured tooth. Typically, this type of treatment is recommended over a filling when there is very little tooth structure left to a tooth. Because it is made of precious metal alloy and/or strong porcelain it acts like a "tooth helmet" to protect the tooth from future cracks and breaks. When fitting you with a crown, we will take care to ensure that the tooth will feel natural so that you can chew confidently. 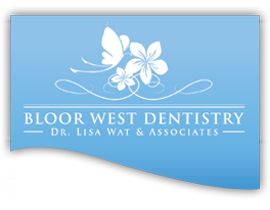 We ensure that we will use a quality lab and materials so that the crown and your tooth it is protecting, will last for many years. Missing teeth? 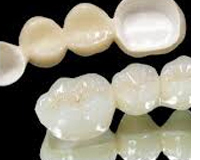 A bridge is a dental prosthesis that is used to replace one or more missing teeth in the same arch. 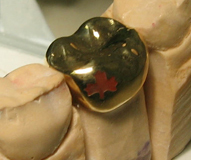 It is made up of prosthetic teeth that are attached to crowns that fit on the teeth adjacent to the space. A bridge is permanently cemented into the mouth; therefore, you cannot remove it. It provides solid support to the structure of the jaw and prevents adjacent teeth from shifting. 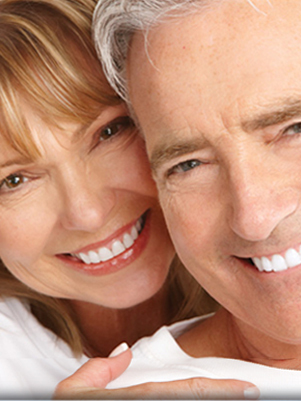 You will never have to be concerned with an ill-fitting partial denture. A bridge helps correct minor bite problems and can even improve speech. When fitting you with a bridge, we will take care to ensure that the bridge will feel natural so that you can chew confidently. We ensure that we will use a quality lab and materials so that the bridge will last for many years.